In The Commonwealth Fund’s third annual report——published in 1921——Barry C. Smith, the Fund’s long-time general director, described a dilemma that continues to vex those of us who work in philanthropy to this day. “The intelligent disbursement of the income from a large endowment...to achieve constructive results in terms of the welfare of humanity is not altogether the simple problem which it might appear to the uninitiated observer,” Smith said. This is an understatement. Smith laid out a number of questions the Fund’s Board of Directors asked to help assess the value of potential grants——questions that still resonate. They touched upon the likely impact of the project, the urgency and financial need, and the extent to which the project would create better coordination, economy, and efficiency in an existing field. In my third year leading The Commonwealth Fund, I find those questions instructive. But one of the greatest challenges we face in developing our strategy has to do with the balance between investing in short- and long-term results. We must do both. In the more than five years since enactment of the most significant health reform legislation in half a century, it’s now clear that millions of Americans are benefitting from the insurance coverage expansions, premium and cost-sharing subsidies, consumer protections, and market reforms ushered in by the Affordable Care Act (ACA). During that time, The Commonwealth Fund’s Health Care Coverage and Access program has monitored the law's implementation and impact through its sponsorship of population-based survey research, analyses of insurance market trends, and tracking of state and federal approaches to the law’s coverage provisions. For example, the latest Commonwealth Fund Biennial Health Insurance Survey——the longest-running nonfederal survey of U.S. health coverage——revealed that uninsured rates have declined to their lowest levels in more than a decade, and that the number of Americans unable to get needed care because of cost is the lowest since the survey was first fielded in 2003. Given the U.S. Supreme Court's most recent ruling, it appears the ACA is here to stay. That doesn’t mean, however, that the longstanding problems with the U.S. health insurance system are a thing of the past. Reaching the millions of adults who still remain without coverage and health care security is one big challenge; another is ensuring that those who are insured, particularly people with low and moderate incomes, can afford their health plans and their health care. Recent Commonwealth Fund research has found that the increasing size and prevalence of high deductibles and copayments in private health plans, including employer-based plans, are leading many people with low and moderate incomes to avoid or delay needed health care. Providing timely information about the ACA’s reforms and the status of their implementation. Tracking enrollment and people’s experiences with the new insurance options. Evaluating the effects of insurance reforms and state and federal innovation on the extent and quality of health coverage, access to health care, changes in employer-based coverage, affordability of premiums and out-of-pocket costs, health plan competition, innovation in insurance markets, and sustainability of the insurance marketplaces. Analyzing and developing national and state short-term policy solutions to address key issues as they arise. Identifying gaps in the law and its implementation that may leave some groups of people without coverage or adequate protection from costs. Health care in the United States is often compromised by fragmentation in the delivery of services, patients’ limited access to care, and spiraling costs. Two groups of patients experience the problems in our health system more intensely and more regularly than any other: those with complex, long-term health care needs, and those with low income, often no health insurance, and few social supports. The Commonwealth Fund’s new Health Care Delivery System Reform program focuses on these individuals because they represent the greatest opportunity to achieve meaningful, rapid gains in the value of health care. According to federal data, 5 percent of the U.S. population accounts for 50 percent of the nation’s health care costs, and 10 percent accounts for 65 percent of total costs. High-cost patients are those with health-related functional limitations requiring not just medical care but frequently also long-term supports and services. These include individuals with multiple, serious chronic conditions like congestive heart failure, coronary artery disease, and diabetes. People living in poverty and without health insurance coverage——a disproportionate number of whom are members of racial or ethnic minority groups——also experience our health system’s shortcomings more acutely. Extensive research shows that economically and socially disadvantaged individuals have greater difficulty obtaining health care, receive lower-quality care, and have poorer health outcomes than other groups. By prioritizing complex and vulnerable patient populations, we as a nation can target our energy and resources where the impact will likely be greatest. Moreover, improvements in care and health for these patients can catalyze improvements throughout the entire health care delivery system. Promoting care systems that coordinate medical care, long-term care services, and community-based resources. Reforming how providers are paid for their services to encourage more coordination, better quality, and greater efficiency. Partnering with payers, particularly Medicare and Medicaid, and with private payers to test and spread effective innovations. Developing the physician leadership needed to address the health needs of vulnerable populations through the Commonwealth Fund Mongan Fellowship Program in Minority Health Policy. Across the globe, health care policymakers face mounting pressure to “bend the cost curve” while at the same time maintaining access to the latest in medical technologies, improving the quality and safety of care, and making the health system more responsive to patients’ needs and preferences. How other countries address these challenges should be of particular interest to the United States, which spends far more on health care——per person and as a percentage of the nation’s economic output——than any other nation and yet receives less in return than most. The Commonwealth Fund’s International Health Policy and Practice Innovations program is guided by the belief that despite differences in how countries organize and finance health care, the U.S. can learn a lot by examining other health systems, their performance in relation to ours, and their health care delivery and payment innovations——particularly those that we might consider adopting. Building an international network of health policy experts and leaders for cross-national research projects and sharing lessons learned. Providing a forum for high-level policy discussion and presenting effective international approaches to policy and care delivery. Fostering transfer of effective innovations in health care delivery from other countries to the U.S. The international program’s annual surveys of patients and clinicians in 11 high-income countries delve into financial barriers to care, chronic disease management, and satisfaction with care, among other topics. The annual International Symposium on Health Care provides health ministers, senior government officials, and leading policy thinkers with a rare opportunity to hear and discuss a range of viewpoints in an unscripted setting, while Capitol Hill briefings inform congressional and executive branch staff about the latest health policy developments. And the Harkness Fellowships in Health Policy and Practice enable promising health care policy researchers and practitioners in 10 countries to spend up to a year in the U.S. conducting policy-oriented research under leading experts and gaining firsthand exposure to innovative models of health care delivery. It’s well documented that health care in the United States is not just expensive—it’s world-class expensive, and unsustainably so. It’s equally well documented that, on many levels, our health system doesn’t measure up on a global scale; we're simply not getting what we pay for. Clearly, it’s going to take more than minor tweaks or adjustments to change our course. It’s going to take a real breakthrough. The Commonwealth Fund’s new Breakthrough Health Care Opportunities program aims to discover and vet transformative ideas that have the potential to expand access to care, dramatically simplify the delivery of care, decrease costs, and improve health outcomes. The program also seeks to “grease the wheels” of the development cycle so that breakthroughs can realize their potential. What do we mean by a breakthrough? Though incremental change is valuable, and The Commonwealth Fund pursues this in many of its other programs, that’s not what we’re looking for here. We mean an idea, paradigm, or strategy that positively and profoundly disrupts the status quo. Whether there have been real breakthroughs in health care delivery is open for debate. The good news is there is no shortage of innovative ideas and——thanks to modern social networks——no limits on the flow of information. But with so many ideas in circulation, the task is to identify which ones have the highest probability of achieving breakthrough impact, and then to generate prototypes and investment models that take us rapidly from concept to reality. The Breakthrough Health Care Opportunities program is exploring emerging technologies, care delivery processes, organizational models, incentives, and policies with a potentially game-changing effect on health system performance. By bringing together innovators, users, entrepreneurs, venture capitalists, and regulators, the program is beginning to facilitate the translation of these innovative ideas into practice. Engaging consumers in their health care through information technology. The next generation of provider incentives, many grounded in behavioral change theory. Developing bundles of innovations whose synergy can lead to transformative change on a large scale. The U.S. health care system is by far the most expensive in the world, consuming 17 percent of the nation’s gross domestic product. That’s 50 percent higher than the share of GDP devoted to health care in the second-most-expensive country (the Netherlands) and nearly double that in many other high-income countries. Despite all that spending, health outcomes for Americans are often worse, while evidence of waste and inefficiency throughout the U.S. health system abounds. Evidence also shows that U.S. prices are out of line with what other developed nations pay for the same medical services, devices, and pharmaceuticals——even those produced in the United States and sold on global markets. All this excess spending is putting a strain on businesses, governments, and household budgets——diverting resources away from investments in jobs, education, and other social and economic needs. What is driving higher or lower costs and spending in health care markets across the country? What policy reforms, innovations in care delivery, or changes in provider payment have the potential to reduce costs while improving outcomes in all regions? Patients with the highest and costliest health care needs, such as people with multiple chronic conditions, are a particular emphasis of the initiative. Research efforts also focus on the cost impact of new medical technologies and changing demographics, as well as the role of prices, the structure of health care markets, treatment patterns, and resource use. By exploring evidence-based approaches to controlling costs, The Commonwealth Fund is contributing to the push for a health care system focused on value. For nearly five decades, Medicare has helped older adults and disabled people of all ages obtain the health care they need while protecting the most vulnerable from severe financial hardship. The Commonwealth Fund’s Advancing Medicare initiative identifies ways in which this crucial program——the largest single payer of health care services in the United States——can serve its beneficiaries more effectively and efficiently while helping to foster health system improvements nationwide. Medicare has enormous capacity to leverage broader change in U.S. health care. More than 50 million aged and disabled Americans access care through the program, which accounts for a large and growing share of the federal budget (the government spends nearly $600 billion on Medicare benefits annually, accounting for nearly one-fifth of total federal non-interest spending). Through the new Center for Medicare and Medicaid Innovation, Medicare has a key role in the development, implementation, evaluation, and spread of innovative models of health care organization, delivery, and payment——not only for Medicare, but for other federal and state health insurance programs and private payers, too. Improve access to care needed by aged and disabled beneficiaries. Assess and disseminate innovations in care delivery and provider payment throughout the program and the entire health system. Improve coordination between Medicare and other public programs, like Medicaid. Work together with private insurers, particularly as the new state insurance marketplaces open for business. Success in each of these areas will help ensure that Medicare remains a vital force in our nation’s health care. To learn more about Medicare’s evolution over the decades, the challenges it faces, and proposed options for addressing them, look for The Commonwealth Fund’s publication series Medicare at 50. The U.S. health system is undergoing major changes intended to expand the availability of high-quality care, achieve healthier outcomes, and lower costs. With the implementation of the Affordable Care Act, the federal government has made a significant investment in expanded health insurance coverage and innovations in the delivery of care to patients. The Commonwealth Fund’s Tracking Health System Performance initiative is assessing the nation’s progress toward these goals, including whether the investment is producing hoped-for gains. Building on the series of health system scorecards first launched in 2006, the Fund is providing policymakers, providers, and the public with performance benchmarks and improvement targets, while helping to inform future action by policymakers and health care stakeholders. Scorecard on Local Health System Performance, which compares performance in more than 300 regions and localities across the U.S. The U.S. health care system is in the midst of significant transformation. We live in an era of expanded insurance coverage options, new insurance market regulations and consumer protections, and private- and public-sector innovation in health care delivery and payment, driven by the imperative to control costs while improving quality. Perhaps never has our government, both federal and state, played a more integral role in ensuring access to affordable health coverage and in designing, testing, and refining new ways to deliver and pay for care. The Commonwealth Fund’s Engaging Federal and State Health Policymakers initiative provides independent analysis of the most pressing health policy issues, tailored specifically for policymakers. The Fund’s team helps inform and educate congressional members and staff, executive branch officials, state legislators, and the broader policy community——across the political spectrum——on issues central to achieving a high-performance health system, with special attention to those affecting the most vulnerable Americans. Through the grantees it supports, the relationships it builds and nurtures, and the briefings, conferences, and retreats it convenes, The Commonwealth Fund has become a valuable source of objective, timely, and relevant analysis for federal and state policymakers of both parties. The Fund’s independence also allows it to serve as a neutral convener, facilitating both state-to-state learning and dialogue between federal and state policymakers to inform policy deliberations and generate solutions. The average market value of The Commonwealth Fund’s endowment rose from $667.3 million to $724.4 million in the fiscal year ending June 30, 2014. Over the last 15 years, and despite the financial markets crisis of 2008-09, The Commonwealth Fund has maintained the purchasing power of its endowment, and over the last 33 years, has been able to restore much of the purchasing power lost in the long market slump of the 1970s. During the 2013-14 fiscal year, the foundation expended $31 million in pursuit of its mission of advancing a high performance health system. The net return on The Commonwealth Fund’s endowment over the 12 months ending June 30, 2014, was 13.6 percent. Due to the foundation’s risk controls, the endowment tends to underperform in strongly up markets like the recent one, while outperforming in strongly down markets. Over the long term, the Fund’s investment returns have been better than those of the market, as well as considerably, and consistently, less volatile. In fiscal year 2013—14, The Commonwealth Fund made 117 grants totaling $18.9 million. View details on each grant here. The Commonwealth Fund’s Board of Directors has fiduciary responsibility for the foundation and is charged with ensuring its accountability and effective pursuit of mission. It is a diverse group, comprising experts and leaders in a number of fields, from health care delivery and policy to finance. Throughout the Fund’s history, the Board has been a policy-setting body, with responsibility for hiring and assessing the performance of the president, advising on and approving program strategies and spending policy, guiding the management of the Fund’s endowment, and assessing institutional performance. Benjamin Chu, M.D., a Commonwealth Fund board member since 2003, was elected chairman in November 2014, succeeding James Tallon Jr., president of the United Hospital Fund of New York (UHF). Dr. Chu, group president of Kaiser Foundation Health Plan and Hospitals in Southern California and Georgia, had earlier served as president of the New York City Health and Hospitals Corporation (HHC), senior associate dean of Columbia University College of Physicians and Surgeons, and vice president for clinical affairs and associate dean at New York University Medical Center. While serving as HHC’s senior vice president for medical and professional affairs, he also was acting commissioner of health for New York City and acting director for Kings County Hospital Center. James Tallon Jr. retired from the Fund’s Board after 18 years of service, including seven as chair. He is nationally recognized for his leadership in health policy, both as president of the UHF for the past 21 years and as a member of the New York State Assembly for 19 years. 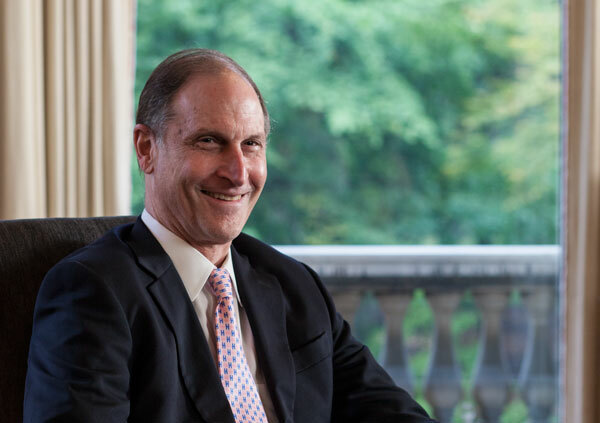 During his tenure as chair, David Blumenthal, M.D., was appointed as the Fund’s seventh president. The Fund has benefited tremendously from the commitment and support of Mr. Tallon and the ability to bring on Dr. Chu as the new chair to lead the Board. Commenting on the transition, Mr. Tallon said, "Ben’s experience as a clinician and a strategic leader in public and private health care delivery and administration will be an invaluable asset to the Fund." Two new Fund Board members were elected in 2014: Mitchell Blutt, M.D., in July, and Mark Smith, M.D., in November. Dr. Blutt is the founder and chief executive officer of the health care investment firm Consonance Capital. Prior to founding Consonance, he was an executive partner of J.P. Morgan Partners. He is also a clinical assistant professor of medicine in the Department of Medicine at Weill Cornell Medical College and the Graduate School of Medical Sciences of Cornell University. He has been a trustee of the University of Pennsylvania and Penn Medicine, its medical school and health system. Dr. Smith was the founding president and chief executive officer of the California HealthCare Foundation, where he served from 1996 to 2013. A board-certified internist, he is a member of the clinical faculty of the University of California, San Francisco, and an attending physician at the Positive Health program for AIDS care at the San Francisco General Hospital. Prior to joining the California HealthCare Foundation, he was executive vice president at the Henry J. Kaiser Family Foundation. He is a member of the Institute of Medicine. Commonwealth Fund Executive Vice President and Chief Operating Officer John E. Craig Jr. retired at the end of 2014. Mr. Craig, who began his tenure at the Fund in 1981, had a profound impact on both the foundation and the field of philanthropy. In his three decades at the Fund, he worked closely with three of the foundation’s seven presidents, oversaw a quintupling of the endowment, and developed systems to increase the effectiveness of grantmaking, the efficiency and transparency of operations, and the impact of the foundation’s work. Mr. Craig has been a critical contributor to other philanthropic entities as well, chairing the Nonprofit Coordinating Committee of New York City and the board of The Investment Fund for Foundations, among many other examples. Cathy Schoen, Senior Vice President for Policy, Research and Evaluation, stepped down in June 2014 after nearly 20 years at the Fund. A longtime member of the executive management team, she served as research director for the Fund’s landmark Commission on a High Performance Health System and directed the Task Force on the Future of Health Insurance. Ms. Schoen also launched and oversaw the Fund’s health system performance scorecards, which have contributed significantly to our understanding of variability in U.S. health care and the health system’s potential to improve.